A night after going for 19 points and 8 rebounds against LSU, redshirt junior Luke Fischer nearly duplicated his performance Tuesday with 18 points and 8 rebounds against Arizona State. Foul trouble limited the big man for much of the game, and he only played 26 minutes before fouling out early in the overtime period. He was still named to the FanDuel Legends Classic All-Tournament team. Freshman phenom Henry Ellenson won tournament MVP after his second double-double in as many nights, dropping 18 points and collecting 11 rebounds in the Arizona State victory. 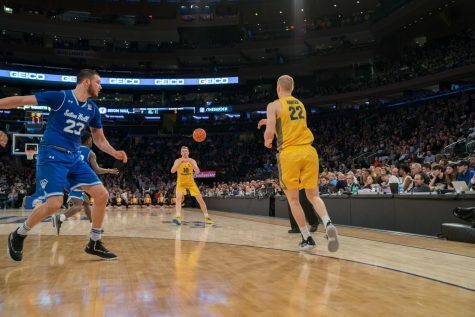 Ellenson played the game with a bum leg after taking a knee to the shin in Monday’s game against LSU. Ellenson didn’t have the long-range game working for him Tuesday, as he went just 6-for-14 from the floor. However, he made a couple post moves around the paint that had to impress the dozens of NBA scouts in attendance. Ellenson’s defense was also notably more improved against a smaller Arizona State lineup. He stayed at home on most of his assignments, manned the center position well while Fischer sat out and registered three blocks on the night. 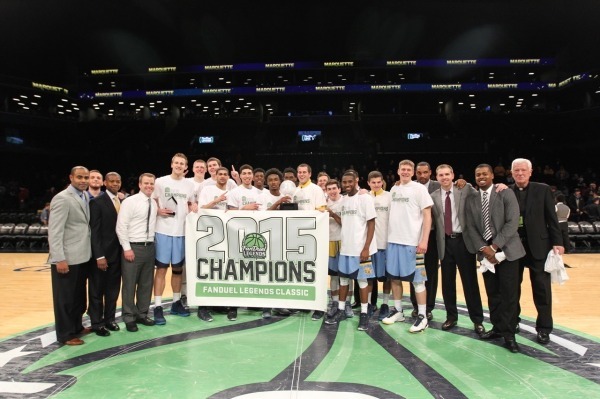 The two wins this weekend were absolutely massive for Marquette’s tournament chances. 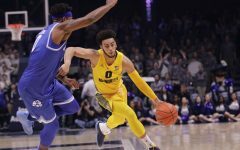 Coming into the season, the consensus was that the Golden Eagles had five good games in their non-conference schedule — home dates against Belmont and Iowa, the game in Madison against in-state rival Wisconsin on December 12, and the two Legends Classic games they played this weekend in Brooklyn. 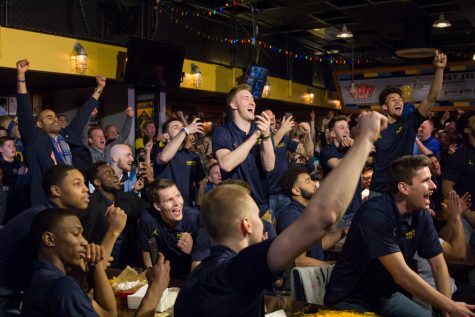 All of Marquette’s other opponents — IUPUI, Chicago State, Grambling State, etc — are Division I dregs that will do virtually nothing for the Golden Eagles’ tournament resume. 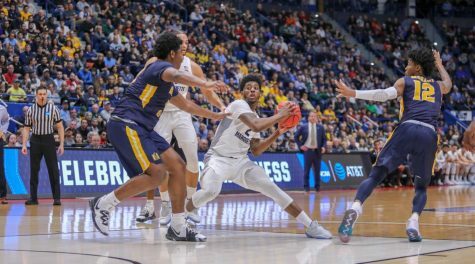 An 83-80 loss to Belmont to open the season, while painful, wasn’t all that damaging to Marquette’s tournament chances, provided that they bounced back with a strong showing against Iowa. However, Marquette’s 89-61 drubbing at the hands of the Hawkeyes put a black mark on their schedule that they didn’t anticipate. 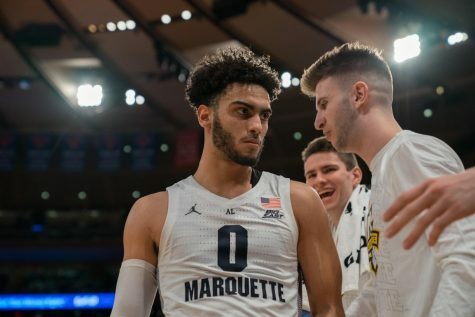 Winning these two games obviously won’t scrub “89-61” from the ledger, but beating a ranked LSU team and an Arizona State squad that some would call a borderline March Madness team gives Marquette a lot more legitimacy. If Marquette can defeat Wisconsin and get convincing wins over the teams they’re supposed to beat, it will be easier to write off the Belmont and Iowa games as a young team that made some early mistakes. 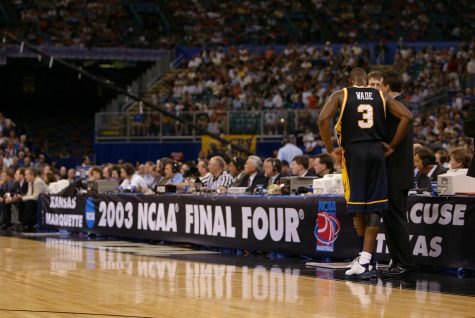 Of course, Marquette will need to couple their non-conference wins with a strong showing in BIG EAST play. 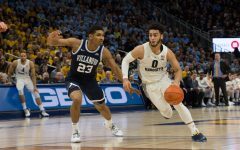 Besides the conference champion Villanova, every team that made the tournament from the BIG EAST last year had between nine and 12 conference wins. 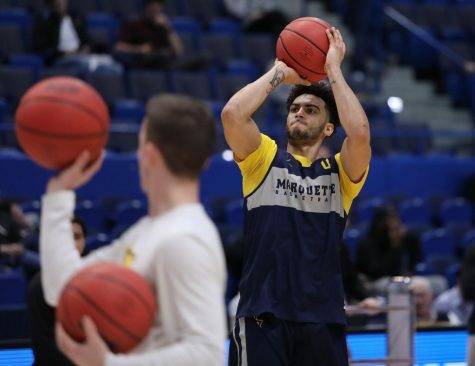 Given their relatively squishy non-conference schedule, Marquette will likely need to be toward the top of that range in order to make a serious tournament case. The trio of Duane Wilson, Traci Carter and Haanif Cheatham controlled the tempo of the game for the Golden Eagles – for what tempo there was through all the foul calls. The freshmen Carter and Cheatham started for the second consecutive night, while the veteran Wilson came off the bench again. They combined for 29 points on 11-of-25 shooting (44 percent). Carter is finally coming into his own as a collegiate point guard. He played most of the game under control while facilitating the offense, dropping 13 points and dishing four assists, while only committing one turnover in a career-high 42 minutes. He also made six of seven free throws. Despite some questionable late game management, the Philadelphia native was generally calm under pressure, which is something his coach was impressed with. There were three teams on the floor today: the Golden Eagles, the Sun Devils and the Zebras — and the Zebras dominated. 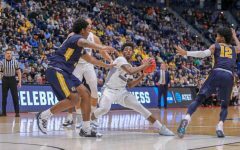 Marquette and Arizona State combined for 51 personal fouls, and five different players fouled out- four for Arizona State and one for Marquette. The refereeing team of D.J. Carstensen, Tim Kelly and Rob Riley called just about every bump, hand check and charge from both teams, and Arizona State head coach Bobby Hurley was visibly fed up with it at his post game press conference. Tighter refereeing also made the players more hesitant to play in the flow of the game. Marquette center Luke Fischer commented that he always had to think about the refs before trying to make a play. College basketball’s commitment to tighter officiating was on display tonight, and there are both positive and negative sides to it. 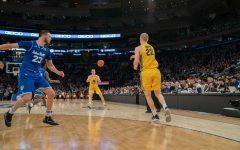 It leads to higher scoring and less plodding defensive slugfests, but it also breaks up the continuous action that makes basketball so appealing to some and puts games more in the hands of the referees, as opposed to the players. Both teams committed a lot of fouls, but there were legitimate gripes to be had with calls that went against both sides. 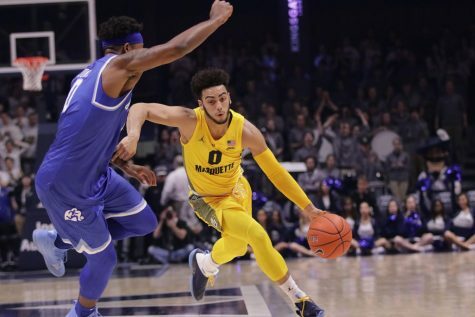 Marquette has shown its youth in a lot of different ways this season, but their propensity for turnovers has been the biggest. However, the Golden Eagles did a much better job hanging on to the ball tonight. After turnover totals of 20, 19 and 22 in their previous three games, Marquette gave the ball away only 11 times against Arizona State. 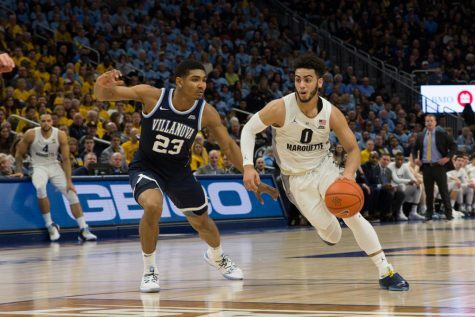 Nearly every single Marquette player that had been struggling with turnovers improved against Arizona State. Duane Wilson rebounded from a four turnover performance against LSU. He only committed two errors on Tuesday night. Traci Carter, who had committed some of the most egregious Marquette blunders of the year, only fumbled the ball away once. Henry Ellenson was the most prudent of all. His renewed focus on the low-post game and lack of reckless dribble drives led to a turnover-free evening. The only player who still turned the ball over was freshman shooting guard Haanif Cheatham, who ceded possession four separate times. His ball-handling abilities are sound, especially for a freshman, but he continues to make poor decisions on entry passes. He has gotten some time at point guard to start the season, but it may be better to have him play the role of scorer rather than facilitator, at least for the time being.